The state’s carer support services sector has greater certainty following a State Government decision to approve the continuation of its funding until June 2020. 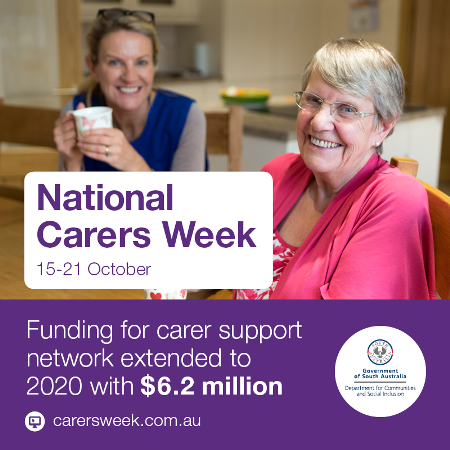 The Carer Support Network SA was advised of the extension during National Carers Week, with $6.2 million committed from July 2018. The network will now work with the Department for Communities and Social Inclusion to develop a carer-specific funding agreement. The decision will help carer support organisations with future service planning during a time of significant national transition. The announcement aligns with a Commonwealth Home Support Program extension of funding. National Carers Week is celebrated each year to acknowledge the significant contribution carers make. There are about 245,000 unpaid carers in South Australia, and it is estimated their enormous support is worth more than $5 billion. Almost one-third of carers provide more than 40 hours of care per week. Nationally, there are 2.8 million carers contributing care valued at more than $60 billion a year. Many provide care and support for a relative or friend who is aged or has a disability, mental illness or a chronic or terminal illness. Most people will either be a carer or require care at some point in their lives. National Carers Week raises awareness of the role carers play in the community in helping some of our most vulnerable people.